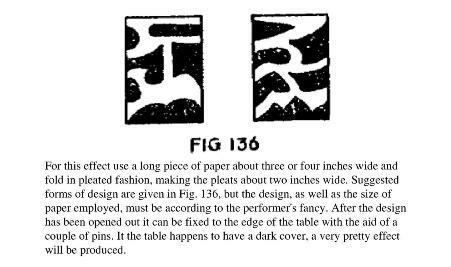 This page attempts to record what is known about the origin and history of Fold and Cut Friezes and Shelf Edging. Please contact me if you know any of this information is incorrect or if you have any other information that should be added. Thank you. Friezes are made by zig zag folding strips of paper and cutting parts of the folded edges away. The Chain of Dolls is a type of frieze. Friezes have been used as shelf edgings. However, I have found it difficult to obtain historical information about this subject. 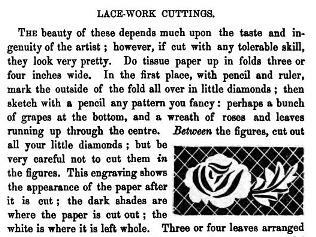 'The Girl's Own Book' by Lydia Marie Child, which was published by Clark Austin and Co in New York in 1833, contains instructions explaining how to make 'Lace Work Cuttings' and use them to decorate candles. The instructions are not particularly clear but it appears this is a form of frieze. 'Paper Magic' by Will Blyth, which was first published by C Arthur Pearson in London in 1920, includes instructions for making a 'Mantel Border'. 'Paper Magic' by Will Blyth also includes a design for a frieze to be used as a 'Flower Pot Decoration'.